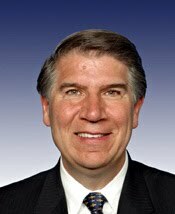 Ernest James Istook Jr. is a former Republican member of the United States House of Representatives from Oklahoma's 5th congressional district. He held his congressional seat for 14 years, completing seven terms in the House. Currently, Istook is a Distinguished Fellow at The Heritage Foundation in Washington, D.C., and also a talk radio host. In 2010 Istook became a Fellow at the Harvard Kennedy School leading a study on Propaganda in American Politics. He was a member of the Appropriations and the Homeland Security committees. He was the Republican gubernatorial nominee in 2006, running against incumbent Democratic Gov. Brad Henry. Istook lost the gubernatorial race by a very wide margin, getting only 33.5% of the vote to Henry's 66.5%.